In August 2018 Jake joined the staff of Mason-Lake Conservation District, serving as the Conservation Technician to support our "Silo to Shoreline" grant. In this role he assists NRCS with existing workload and helps more of our landowners to navigate Farm Bill programs. His projects include a wide variety of activities such as planting cover crops or nutrient management on farms, forestry management practices, pollinator plantings, and conservation work in the Lincoln and Sable River watersheds. Jake graduated in 2015 with a Bachelor’s degree in Fisheries and Wildlife Management from Lake Superior State University. 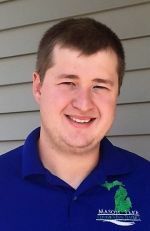 Since then, he has had the opportunity to work with Northpoint Fisheries Management as a Habitat Technician on the Au Sable River working with private landowners to develop and implement conservation practices within riparian zones and rivers. He also spent time seasonally with the Michigan Department of Natural Resources constructing wildlife plantings and habitat improvements on State Game Areas. Outside of work, Jake can be found enjoying his time out on the lake or in the woods whether it be fishing, hiking or hunting.